Elba 2Rbnder A4 PVC 25mm Black 400001512 Pack of 10 Elba A4 2-Ring Binder 25mm Black. 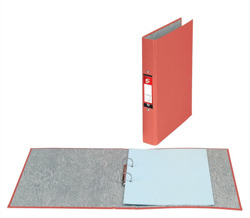 Premium quality ring binders with a heavyweight plastic covering for increased durability. Elba Vision 25mm RBnder 4R Blu 100080876 Pack of 10 A4 25mm capacity ring binders made from strong plastic covered board. Side loading clear front cover pocket for immediate and easy personalisation. Product can be personalised for free using www. elbaprint. com. Colour: Blue. Elba Vision 4RBndr A4 25mm Red 100080880 Pack of 10 A4 25mm capacity ring binders made from strong plastic covered board. Side loading clear front cover pocket for immediate and easy personalisation. Product can be personalised for free using www. elbaprint. com. Colour: Red. Elba Vision 25mm RBnder 2R Wht 100080889 Pack of 10 Vision binder PVC 25mm capacity with clear pocket on the front ideal for personalised presentations - side loading pocket. Label holder on spine for easy reference. White. Elba Vision 25mm RBnder 2R Red 100080890 Pack of 10 Vision binder PVC 25mm capacity with clear pocket on the front ideal for personalised presentations - side loading pocket. Label holder on spine for easy reference. Red. Elba Vision 25mm RBnder 2R Blk 100080891 Pack of 10 Vision binder PVC 25mm capacity with clear pocket on the front ideal for personalised presentations - side loading pocket. Label holder on spine for easy reference. Colour - Black. Elba Cloud LAF Portrait A3 100080746 Pack of 1 High quality A3 board lever arch file, with compressor bar and 70mm capacity. Ideal for use with Bantex A3 Punch Pockets. A3 upright Black. Elba Cloud LAF Landscape A3 100080747 Pack of 1 High quality A3 board lever arch file, with compressor bar and 70mm capacity. Ideal for use with Bantex A3 Punch Pockets. A3 oblong Black. Elba 2Rbnder A4 PVC 25mm Blue 400001508 Pack of 10 Elba A4 2-Ring Binder 25mm. Blue. 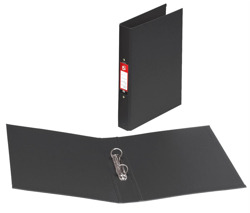 Premium quality ring binders with a heavyweight plastic covering for increased durability. Leitz RingBinder WOW A4 2DR Pnk 42410023 Pack of 10 Leitz WOW Ring Binders. 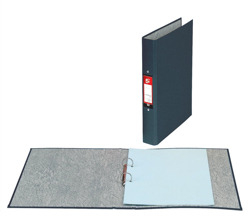 Glossy laminated paper on board binders with a 2D-Ring 25mm mechanism and compressor bar (capacity - up to 250 sheets). Size - A4 Maxi (318 x 270 x37mm). Colour - Metallic Pink.